Potential Labor Secretary Andrew Puzder having second thoughts, CNN says. 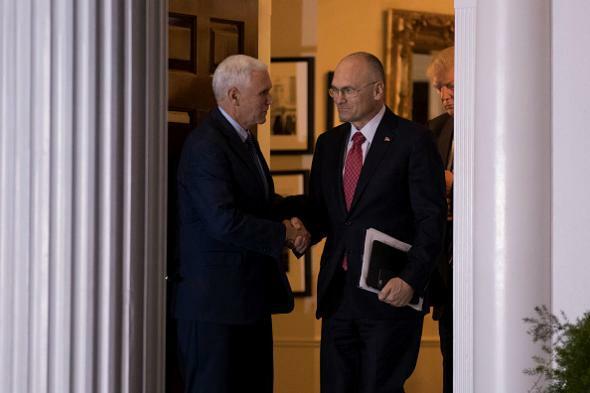 Andrew Puzder with Mike Pence and Donald Trump on Nov. 19 in Bedminster Township, New Jersey. Hmm—“the pounding he is taking” might not have been the ideal way to describe the experience of someone who’s accused of having hit his wife. (For what it’s worth, the CNN piece does not specifically mention the abuse claims as one of the reasons for Puzder’s second thoughts.) In any case, Puzder tweeted after CNN’s report that he is “looking forward” to his confirmation hearing, which is expected to take place in February. Update, 10:45 a.m.: I should add that Puzder denied his ex-wife’s allegations at the time and continues to deny them today.